26-Port Max PoE Gigabit Smart Managed Switch με 24xPoE & 2xcombo 10/100/1000BASE-TX. Η σειρά ..
5-Port Gigabit Desktop Switch Αυτό το switch για επιτραπέζιους υπολογιστές προσφέρει έναν οικονομ..
10-Port PoE Gigabit Smart Managed switch, 8xPoE & 2xSFP ports. H σειρά D-Link DGS-1210 Smart ..
10-Port Gigabit Smart Managed switch, 8xGigabit & 2xSFP ports. 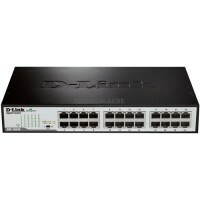 H σειρά D-Link DGS-1210 Smart ..
16-Port Gigabit Smart Managed switch, 16xGigabit, 4xcombo 1000BASE-T/SFP ports. H σειρά D-Link DG..
20-Port Gigabit Smart Managed switch, 16xGigabit & 4xSFP ports. H σειρά D-Link DGS-1210 Smart..
24-Port Gigabit Smart Managed switch, 20xGigabit & 4xcombo Gigabit/SFP ports. H σειρά D-Link ..
24-Port PoE Gigabit Smart Managed switch, 24xPoE Gigabit & 4xcombo Gigabit/SFP ports. H σειρά..
24-Port Gigabit +4 SFP Unmanaged Metro Ethernet Desktop Rackmount Switch Το DGS-1210/28 είναι ένα..
28-Port Gigabit Metro Ethernet Smart Managed switch, 24xPoE Gigabit & 4xSFP ports. H σειρά D-..
28-Port Max Poe Gigabit Smart Managed switch, 24xPoE & 4xSFP ports, 370W. H σειρά D-Link DGS-..
28-Port Gigabit Max PoE Metro Ethernet Smart Managed switch, 24xPoE Gigabit & 4xSFP ports. H ..
24-Port Fast Ethernet PoE +2 Gigabit Ethernet +2 Combo SFP Unmanaged Metro Desktop Rackmount Switch ..
24-Port Gigabit PoE +4 SFP Unmanaged Metro Ethernet Desktop Rackmount Switch Το DGS-1210/28P είνα..
48-Port Gigabit Smart Managed switch, 44xGigabit & 4xcombo Gigabit/SFP ports. H σειρά D-Link ..